Over the past few years, Harley Davidson has had to make numerous changes to remain competitive. The first thing we will take a look at is global competition. Harley Davidson’s increasing demand overseas has caused many changes over the past few years. The second thing we will take a look at is new competition. The demographics of the nation have been changing, due to the aging of the “baby boomers,” and Harley has to make changes in order to keep up with the competition of the market. New competition ranges for sport bikes to other competing cruiser models. The third thing we will look at is competitive remakes and accessories. The competition for Harley is on the rise due to the high interest in custom motorcycles and cheaper accessories. The fourth thing we will take a look at is motorcycle buyer’s demographics. The market is ever changing and it is important to look at how Harley is adapting to these changes. The final thing we will address is how the World Wide Web has affected the growth of the company. This company has been able to adapt to the changing market for the past 100 years and it is important to study the success of age-old companies like Harley Davidson. According to Commerce Capital Markets, an investment firm, Harley Davidson is still struggling to meet the demand for their vehicles internationally as described in the case. What this means however, is that they sell virtually every vehicle they export to key markets besides the US, but they are still failing to capitalize on rising international demand. The United States represented 84 percent of Harley Davidson’s shipments, 10 percent to Europe, and 6 percent to Japan and Australia in 2003 (Pershing par. 9). Asia represents the smallest percentage for a few obvious reasons. First, it is the result of a rise of Japanese firms both in quality and sheer numbers. Harley Davidson has misrepresented its strong brand image in Asia by having waiting lists as long as two years to purchase some of their vehicles. Consumers, therefore, have been more open to simply purchase a competing firm’s product all of which are now showing improved quality. Firms such as Yamaha, Suzuki, Kawasaki, and Honda are only a few. Yamaha and Kawasaki are using their strong brand image created by their successful lines of personal watercraft (jet skis) to enter the lucrative global motorcycle market. Suzuki and Honda have exploited the same technique to carry their brand image for automobiles into other vehicle markets as well. Commerce Capital Markets (CCM) predicts that they will continue to gain market share over their Japanese and European competitors for the year 2004. They attribute this to the opening of a new Harley Davidson plant in York, Pennsylvania USA. CCM is predicting this new plant scheduled to be operating in 2004 will help Harley Davidson meet its incredible demand both in the US and internationally (Pershing par. 16). BMW, Harley Davidson’s main European competitor, took a hit to their image and market share a few days ago when they had to recall one of their new 2005 models due to a complicated problem that caused the fuel line to become severed and engine to stall. So for the immediate future, Harley Davidson can expect BMW sales to decline slightly providing Harley Davidson an opportunity to gain some of BMW’s former customers. Harley Davidson must begin to utilize their new capacity added from the York plant to meet its staggering demand internationally so that they no longer lose revenue as competitors exploit their over-flow from stock-outs and waiting periods. Another strategy Harley Davidson may look into is building a plant in Japan. With the Yen falling in the market recently, some Japanese consumers are finding the US manufactured Harley Davidson vehicle too expensive compared to its Japanese counterparts. By producing in Japan, Harley will not only increase it’s already strong image in Asia, but also be able to compete price-wise with Japanese producers in a market they constantly lose sales in due to underproduction and stock-outs. As the population of America grows older with the Baby Boom generation reaching retirement age and with increased average income, the market is ripe for luxury personal vehicles such as motorcycles. This new demand is causing firms, new and old to enter the market. Companies such as Excelsior-Henderson and Indian are returning to the market after a considerable hiatus with plans to compete directly with the industry leader Harley Davidson. When Indian went out of business in 1954, they left behind a great deal of enthusiasts. Indian (1901) was established one year before Harley Davidson (1902) and was their most fierce competitor in the v-twin market up until their eventual demise. Indian was always regarded as the “anti-Harley” and the comparison of the two was no doubt a matter of argument for many owners. They even went so far as to hold a “Counter-Celebration” in Milwaukee, Wisconsin near where Harley Davidson held its 100-year celebration festivities in 2002 (Kern par. 10). Many enthusiasts are excited about Indian producing again for the first time in almost 50 years; this will stimulate many to buy the more expensive bike and help fund their future expansion. One of the newest firms to cross over from other personal vehicles is Polaris, manufacturer of the Victory series of bikes. Though only recently expanding from their usual line of snowmobiles, their Victory bike is considered a more aesthetically pleasing vehicle compared to Harley Davidson. Motorcycle Cruiser magazine compared the Polaris Victory Vegas and the Harley Davidson Deuce, both of similar size and power. Some of the strengths they noticed were Harley Davidson’s overall comfort and customer service after purchase, both areas they marked negatively for the Polaris Victory Vegas (Art par. 35). Overall, however, the article gave Polaris the most praise for appearance, saying the Harley-Bike was too understated when compared with the Polaris. More modern body designs might be in order if Polaris catches on with consumers. In looking on the Internet to compare Harley Davidson to the new Excelsior-Henderson vehicles, we found more of our matches were for those seeking to buy or sell a classic Excelsior-Henderson. Apparently there is a large demand for their classic models as collectors’ items but we didn’t find much documentation for the new models and how they compare to the industry leader. This leads us to believe however, that there are obviously a large number of Excelsior-Henderson fans still out there creating what could be a very large market. The market for luxury, brand name motorcycles is growing and will continue to grow as our population becomes older and higher paid. It is for this reason that many firms are entering the market recently, for Harley Davidson these new comers and even those that are coming back are no real threat, they are just an indicator of how much the demand is rising. As the industry leader, if Harley continues to expand their production and capitalizing on the demand they’ve created, they will continue to grow and be very successful. Harley Davidson has the challenge of overcoming many different types of competition. Custom motorcycle companies are a new trend and the style that once distinguished Harley from others is becoming more common. Also, more and more competitive parts and accessories are becoming available. There is new competition for every segment of the industry. Harley Davidson must analyze the market and make a strategic plan to remain known as an outstanding motorcycle company. Custom motorcycles are becoming a big craze. There are a number of custom motorcycles manufactured in America now and some even have their own television shows which is accelerating the demand for custom bikes. Most custom cruising bikes in the market have a style very similar to that of Harley, from the shape of the frames to the V-twin style engines. Custom bike companies such as American IronHorse Motorcycle Company and Big Dog Motorcycles are major competitors for Harley. They each offer a wide variety in style and a vast array of customizations; their engines are bigger and stronger; and in some people’s opinion, their products are more admired (American, Big Dog). The good news is that they can cost thousands more than stock Harley Davidson models. Harley is able to remain in competition with custom manufacturers using a few tools. Although Harley Davidson is known as a pricy brand name, custom motorcycles are more costly. Harley offers many chrome accessories that can only be used to customize Harley products (Harley-Davidson). These accessories offer a level of customization that has not been matched by any custom bike company. The parts generally offer a performance benefit as well as enhance the bike’s appearance, so Harley has been able to keep a competitive edge over the bigger and stronger engines. Finally, the Harley Davidson image is impeccable, so few Harley enthusiasts have changed their preference to a custom model and the value of Harley Davidson products continues to rise from their initially high cost. Harley Davidson is a company that is known for concentrating exclusively on the motorcycle industry, offering everything from motorcycles and parts to accessories and knickknacks (Harley-Davidson). The accessory sector of the company is now being challenged with an enormous selection of alternative products. Custom Chrome, EasyRider Roadware, Bikers Choice, and Dealer Leather are a few of the companies that produce and distribute saddlebags, chaps, leather jackets, and other accessories that compete directly with Harley Davidson products. These competing products offer a similar quality for a lower price, which makes it difficult for Harley to compete in certain segments of the market. Harley is able to compete with these distributors because brand recognition fuels a substantial demand for Harley Davidson accessories. Harley Davidson has been able to remain in competition for over a 100 years and will continue to hold that position, with the help of a good strategic plan (Harley-Davidson). Along with continuing to research and develop motorcycle technology, Harley should address some other factors in distinguishing attributes. Certain custom motorcycle companies build every bike from scratch, starting with welding a frame together (Orange). Harley Davidson should explore the possibility of opening a new sector which should offer a 100 percent custom Harley Davidson motorcycle. The bikes produced in this sector will not only have a competitive edge over other custom manufacturers because they will carry the Harley Davidson name, but they will also offer bigger engines, custom paint, and various options that are not offered by other manufacturers. Harley Davidson accessories have the reputation of being an elite product and will maintain that image by increasing quality. Harley has a large customer base that is dedicated, involved and satisfied with the company. Loyal customers often market Harley through one of the most effective tactics, word of mouth. The motorcycle industry is growing and Harley has a large share of the market, so it is in a great position for success. With over 100 years of success and experience, Harley Davidson should not have a problem continuing to be one of the most competitive companies in the industry. Competition is growing in a few key areas, and as long as Harley addresses these new forms of competition, the company will prevail. The demographics of Harley-Davidson buyers have changed many times over the motorcycle company’s 102-year existence, and will probably continue to change. Harley-Davidson became popular right around the same time as the baby boomers were growing up. This plays a major part in the demographics of Harley-Davidson customers today. Harley-Davidson is also trying to attract new markets. In the mid 1970’s there was a major increase in Harley sales. These customers were the baby boomers in their twenties. In the 1980’s there was a major decrease in Harley-Davidson customers (Motorcycle sales—it’s all about the demographics). This was the baby boomers settling down and starting families. They needed money so they sold off their bikes. Well the baby boomers are back. In 2001, the median age of American motorcycle buyers was 38, where as Harley’s average buyer was 46 (Zackowitz). Forty-six years of age would be the age of the average “baby boomer” today. “According to the National Center for Health Statistics, births peaked nationwide in 1957” (Motorcycle sales—it’s all in the demographics). These “baby boomers” have enough money and security to buy the bike they have been missing for the last 20 years. Another group has entered in to the Harley-Davidson culture. Women went from making up two percent of Harley-Davidson customers in 1987 to making up nine percent in 2001(“Demographics”). We should continue to see this percent rise as Harley-Davidson continues go after the female market. In today’s world the average 20 year old cannot afford the expensive price of a Harley-Davidson motorcycle. Twenty year olds today want something flashy with an affordable price tag. Harley has come up with the V-Rod to compete with the sleekness and flashiness of the foreign bikes. The V-Rod is still an expensive bike and the younger market cannot afford it. In the future we believe we will see Harley-Davidson go after the younger market. Harley-Davidson’s customers are getting older and pretty soon they will be retiring their bikes. Unless Harley-Davidson can attract a younger market, we will see their sales decrease. Harley-Davidson will also continue to go after the female market, which should help their sales. If Harley-Davidson can attract those two markets, they will increase revenue for many years to come. Harley Davidson’s stock price has skyrocketed since 1998 from around $30 a share to just over $60 a share today. This rise is in large part due to their internet site (Harley-Davidson). Their site allows people to look at all the new models that they release every year which makes the consumer more likely to go out and buy a new motorcycle. A specific example of this was in 2001 when Harley-Davidson released the V-Rod. This was the first motorcycle to combine fuel injection, overhead cams and liquid cooling, and deliver 115 horsepower. Just two months after the internet site featured information and pictures on the new motorcycle stock prices jumped almost 10 points from $45 a share to $55 a share. Another case of web site advertising was in 2002 when Harley-Davidson featured pictures and information about the Buell Firebolt on their site (Buell is a subsidiary of Harley-Davidson). Just four months after the information was posted, their stock price jumped almost 14 points from $46 a share to just under $60 a share. Harley-Davidson’s internet site has generated enormous amounts of revenue increases for another reason, international sales. With the ability to view motorcycles online, it makes Harley-Davidson motorcycles available to people outside the United States and not located near Brazil, which is the only assembly facility outside of America. It allows people in such places as the United Kingdom or Australia the ability to view the motorcycles and learn all the information about them before having to fly hundreds of miles to see the motorcycles and decide they don’t like them enough to buy them. All of Harley-Davidson’s main competitors also have internet sites. However, there are huge differences in their competitor’s sites and their own. Harley-Davidson focuses solely on motorcycles and in fact is considered an “anti-website”. They try to convince their consumers to go out and ride a Harley instead of being on the internet. All of Harley-Davidson’s competitors are also in other businesses. Yamaha, which is one of Harley-Davidson’s main competitors, is involved in musical instruments, professional audio products, and computer products (Businesses). Suzuki, another main competitor, is involved in cars and outboard motors (Global). Having these other products on their sites makes it less likely that someone would choose them over Harley-Davidson. This is mostly due to the fact that Harley-Davidson focuses solely on motorcycles and the competitive companies focus on other things as well which may not give them as much expertise as Harley-Davidson has in the motorcycle field. Their expertise can be shown by the fact that they have recently celebrated their 100-year anniversary as a company. Harley-Davidson’s internet site also offers sections where people can write questions they may have about the company or about specific bikes they wish to order. Questions such as “I want to buy a particular model but I think I’m too short to fit on it. What can be done?” (Harley-Davidson). The employees for the company check this site and answer people’s questions so they know before they go to a dealer what needs to be done to a bike in that specific situation. The site also helps people try and figure out their financing issues so they can figure out if they are able to afford a motorcycle. 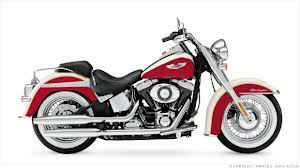 It is important to look at various segments of the market while analyzing companies such as Harley Davidson. First it is important to keep up with demand in new markets in order to keep up with the competition. It is also important to keep an eye on emerging competition in the existing market. Companies that enter the motorcycle market are potential threats to Harley Davidson. Another important item to take a look at are different parts of the industry. There is a high level of customization in demand for the motorcycle industry and Harley needs to be ready to answer back when new forms of customization surface. Also, each part of the industry, such as accessories, is susceptible to competition, and it is a good idea to research and improve all segments of the industry. We should also keep it mind that it is important to re-segment our market often by analyzing motorcycle buyers and researching where the demand is going. Finally, it is important to remember that the World Wide Web is great tool for penetrating the market and growing a company. Harley Davidson is 100 years old and going strong, so it is a company that is beneficial to analyze. It will continue to do well in the future as long as it is able to address each part of the industry and adapt to any changes. “Demographics.” Harley-Davidson corp. <http://investor.harley-davidson.com/demographics.cfm?locale=en_US&bmLocale=en_US>, Retrieved on September 29, 2004. “Motorcycle Sales—it’s all in the demographics.” http://www.kafalas.com/urbcol26.htm retrieved on September 29, 2004. Zackowitz, Margaret. “Harley’s Midlife Crisis.” <http://magma.nationalgeographic.com/ngm/0308/resources_geo.html, Retrieved on September 29, 2004.